The PORTER-CABLE TS056 18-Gauge Pneumatic 3/8 in. Crown Stapler is as versatile as it is tough. This tool fires both heavy duties 3/8 in. Crown staples from 1/4 in. to 9/16 in. and 18-Gauge Brad nails from 1/2 in. to 5/8 in. Having this versatility allows for a wide range of fastening applications, such as insulation, vapour barrier, flooring underlayment, screening and felt paper. Oil-Free operation requires no regular maintenance and eliminates the risk of oil stains. The Grip-Rite GRTSN150 18 Gauge Narrow Crown Stapler is tough, reliable, and will keep the most demanding professional going all day long. This tool's lightweight and compact design make it ideal for working in tight spaces. Applications include exterior trim, furniture, baseboards, chair rail, casing, paneling, soffits, floor underlayment, cabinets, counter top blanks, and hobby projects. Features like the durable magnesium housing, 360 tool-free air exhaust, and the rotating belt hook make this tool easy to handle. It is also equipped with a tool-free nose latch for quick jam clearing and a fast and easy top load design. The GRTSN150 holds up to 140, 18 gauge, 1/4 in. Crown staples ranging in size from 3/4 in. - 1-1/2 in. Also included with the purchase of this tool: Carrying Case and Owner's Manual, Safety Glasses, All Required Hex Wrenches, Tool Oil, a Male Air Plug and Optional "Sequential" Trigger Kit. The M18 FUEL 16ga Straight Finish Nailer delivers on the promise of peak productivity at your worksite, providing unmatched driving power, speed and efficiency with practically no set up and minimal maintenance. Using the exceptional application speed, power and durability of our compact POWERSTATE Brushless Motor, plus our ready to fire cylinder design, this tool is capable of fully sinking 2 nails into solid oak with zero ramp-up time. This 18-volt nailer operates from the revolutionary REDLITHIUM Battery for unbeatable strength and run-time, eliminating the mess and cost of gas cartridges. It also includes REDLINK PLUS Intelligence, the most advanced electronic system on the market, to prevent damage to the nailer and battery from overloading and overheating. The M18 FUEL Nailer not only primes you for top performance; it also creates the experience of a pneumatic nailer that professional carpenters and remodelers expect, without the hassle of compressors and hoses. PORTER-CABLE TS056 18-Gauge Pneumatic 3/8 Inch Crown Stapler The PORTER-CABLE TS056 18-Gauge Pneumatic 3/8 in. Crown Stapler is as versatile as it is tough. This tool fires both heavy duties 3/8 in. Crown staples from 1/4 in. to 9/16 in. and 18-Gauge Brad nails from 1/2 in. to 5/8 in. Having this versatility allows for a wide range of fastening applications, such as insulation, vapour barrier, flooring underlayment, screening and felt paper. Oil-Free operation requires no regular maintenance and eliminates the risk of oil stains. 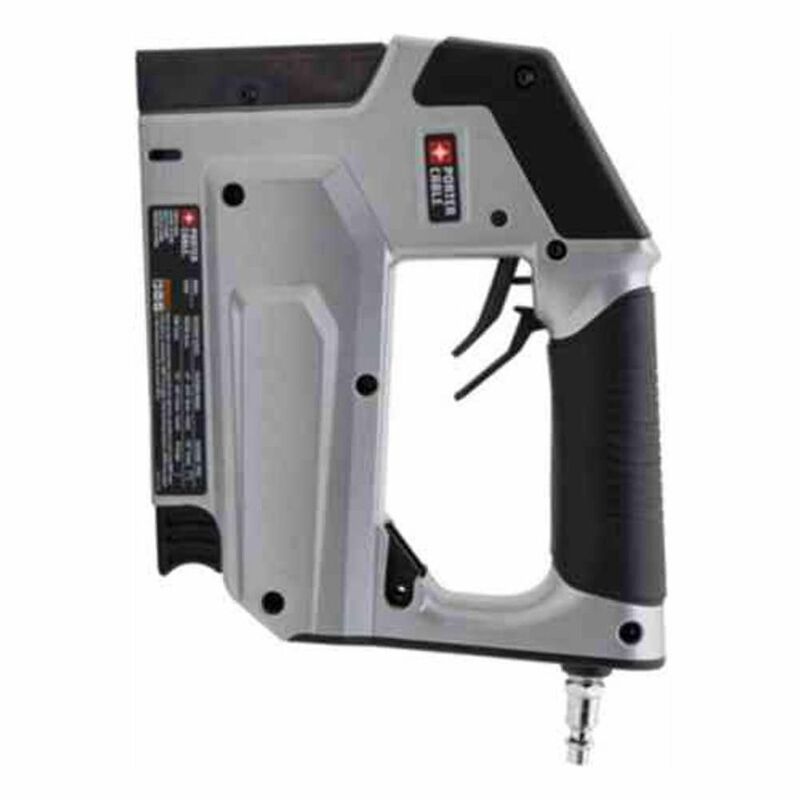 PORTER-CABLE TS056 18-Gauge Pneumatic 3/8 Inch Crown Stapler is rated 4.0 out of 5 by 131. Rated 5 out of 5 by Kate from Works great! Using it to staple hardware cloth to 2x4s... Works great! Using it to staple hardware cloth to 2x4s on my chicken run! Easy to use and making the job go so much faster and easier! Love it! Rated 5 out of 5 by JNick from Easy to use - happy with it.... Easy to use - happy with it. Rated 2 out of 5 by Steve from This is the third one I've had to buy. The... This is the third one I've had to buy. The stapler works great for a while, but after some heavy use they seem to terminally jam up, and GOOD LUCK unjamming it. Sadly, there is no viable alternative so I have to keep buying them. Rated 1 out of 5 by HomeDepotCustomer from While the stapler is lightweight and powerful, I’m having the... While the stapler is lightweight and powerful, I’m having the same issues everyone is having, it doesn’t always send a staple. It seems to fizz out and not always work. This is the second one I bought because the first came with the compressor kit. Rated 4 out of 5 by Redbone from Seems like a very solid stapler. I like the... Seems like a very solid stapler. I like the safety trigger. Better than a bump type safety.